Coca-cola unveiles world's first drink dispenser that is also a sophisticated marketing device. The U.S. Army is organizing video-game parties as part of its recruitment strategy. Research shows Republican brains are different from Democrats' (not that there's anything wrong with that). 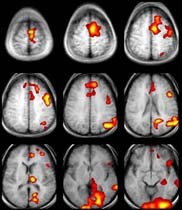 This is your brain deciding: Scans of the human brain making a decision have intriguing implications for selling products. How are you measuring customers? What to spend to acquire a customer?